This book is designed to provide leadership educators with a wealth of classroom and workshop activities, discussion and reflection questions, assignment suggestions, and additional resources such as video clips and supplementary readings. It also includes several case studies for students to consider the implications of applying all eight elements of the Social Change Model in a variety of contexts. 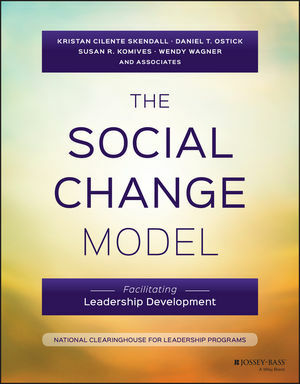 The Social Change Model of Leadership Development—upon which the book is based—was designed by well-known leadership educators and received wide acclaim and use. The validity of this model has been established through a number of research studies including the Multi-Institutional Study of Leadership. Helps curricular and co-curricular leadership educators teach the Social Change Model through individual and group activities, reflection questions, and discussion questions. If you're a leadership educator of high school, undergraduate, or graduate school students, The Social Change Model: Facilitating Leadership Development is indispensable reading. Please note that The Social Change Model: Facilitating Leadership Development is intended to be used as a Facilitator's Guide to Leadership for a Better World, 2nd Edition (978-1-119-20759-7) in seminars, workshops, and college classrooms. You'll find that, while each book can be used on its own, the content in both is also designed for use together. A link to the home page of Leadership for a Better World can be found below under Related Titles. KRISTAN CILENTE SKENDALL is currently the Associate Director of the Gemstone Honors Program, a four-year undergraduate team research program in the Honors College at the University of Maryland. She is a co-lead facilitator with the LeaderShape Institute, has taught numerous leadership courses, has presented at dozens of national and international conferences, and was a member of the Multi-Institutional Study of Leadership Research Team. DANIEL T. OSTICK is Assistant Director for Student and Staff Development in the Department of Resident Life at the University of Maryland. He is the author of "Leadership and Diversity" in the Handbook for Student Leadership Programs (2006) and The Handbook of Student Leadership Development (2011). He was co-editor of the Facilitator's Guide for Leadership for a Better World as well as the Facilitator's Guide and Student Workbook for Exploring Leadership. SUSAN R. KOMIVES is professor emerita from the University of Maryland and cofounder of the National Clearinghouse for Leadership Programs (NCLP). She is coauthor of Exploring Leadership: For College Students Who Want to Make a Difference (1998, 2007, 2013), and co-editor of Leadership for a Better World: Understanding the Social Change Model of Leadership Development (2009, 2017). Additionally she was a member of the Ensemble that developed the Social Change Model of Leadership Development. She served as co-Principle Investigator for the Multi-Institutional Study of Leadership (now with 350 campuses and nearly 400,000 student responders examining the Social Change Model of Leadership Development). WENDY WAGNER is the Honey W. Nashman Fellow for Faculty Development in the Honey W. Nashman Center for Civic Engagement and Public Service and visiting assistant professor of human services and social justice at The George Washington University. She was a co-editor of the first and second editions of Leadership for a Better World. She was also co-editor of The Handbook for Student Leadership Development and lead editor for the Facilitator's Guide and Student Workbook for Exploring Leadership.